There already exists an excellent biography of the life and work of Henry Joseph Moule written by Gwen Yarker of the Dorset County Museum. The biography is full of information about Henry Joseph and was produced as a companion to the exhibition called “A Victorian’s view of Dorset” organised in 1997. For those particularly interested in Henry Joseph or wishing to gain further insight into life in Fordington and Dorchester during this period, a copy of this 40 page booklet, which contains some illustrations of his work, can be purchased for a modest fee direct from the Dorset County Museum. 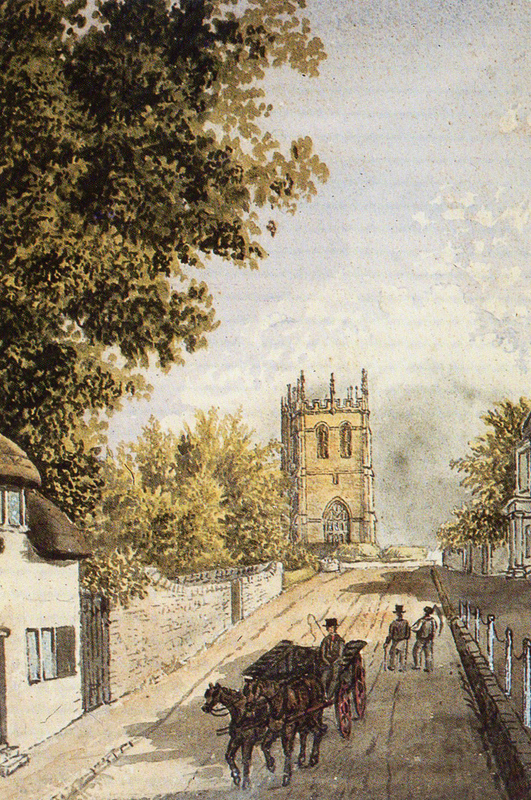 I compiled the following account of his life before I became aware of the existence of the biography, and my brief history produced below is designed to show his place in this remarkable family which was so important to the development of Fordington. 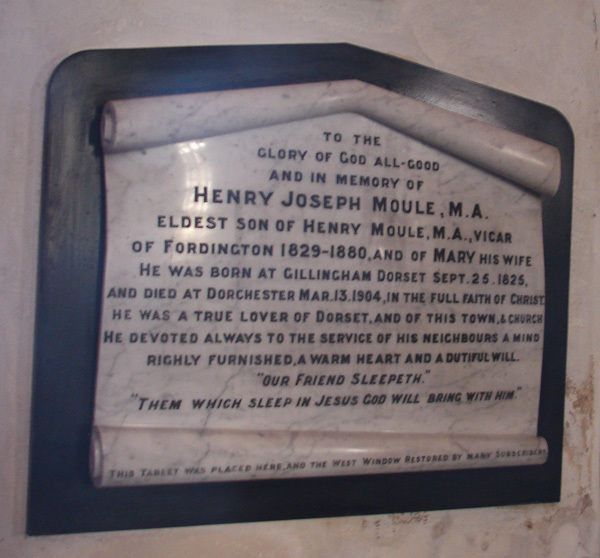 Henry Joseph Moule was born on 25th September 1825, the eldest son of Reverend Henry Moule [1801-1880] and his wife Mary Mullett Evans. He was duly baptised by his father, who was Curate in sole charge of the church of St Mary the Virgin in Gillingham, on the 14 October 1825. In 1829 his father became the vicar of St George’s Church in Fordington, so from the age of 4 he grew up at the vicarage there. As already outlined in the biography of his father this was a difficult time for Fordington and the Moule family in particular. Despite this Henry Joseph and his siblings all retained fond memories of their days spent in this busy household, where his father had a study and taught the sons of the wealthy the classics and Hebrew in preparation for University. There was also a constant stream of important visitors as his father, an evangelist, held clerical seminars and people came from far and wide to spend time at their fireside. 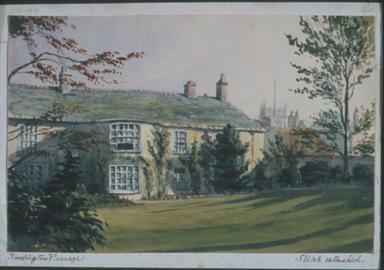 The picture shown here is only one of many Henry Joseph painted of the vicarage. He was taught initially by his father alongside his paying pupils, and then at the University of Cambridge, entering Corpus Christi College just 4 months short of his 19th birthday on 27 May 1844. He obtained a BA degree in 1848 and an MA in 1853. Henry Joseph was a close friend of Thomas Hardy for fifty years, their first meeting being shortly before 1854. As he was 15 years older than Thomas Hardy it seems likely that they met when Henry returned to Fordington from University and Thomas Hardy was still quite young. There can be no doubt they were close friends as he encouraged Hardy’s development from an impressionable age, was a regular visitor to the Hardy household, and in later life taught Thomas how to paint. At this time the Moule family were also friendly with the Reverend William Barnes the Dorset Poet and Philologist who also acted as a mentor to Thomas Hardy. Henry Joseph was a devout Christian from early in his life, but unlike his father, did not aspire to be a church minister. An indication of the social circles he moved in however can be gleaned from the fact that soon after he left Cambridge he became tutor and secretary to the family of Lord Wriothesley Russell who had been Rector of Chienies in Buckinghamshire since 1829. Lord Wriothesley Russell was the 4th son of John Russell the 6th Duke of Bedford, and during the time that Henry Joseph was his secretary Lord Russell was also Deputy Clerk to the Closet of Queen Victoria. Having sketched from an early age, Henry Joseph took the opportunity of his travels on the continent to record his journeys in watercolour. Paintings done in France during the mid 1850’s for example, are among those donated to the Dorset County Museum. 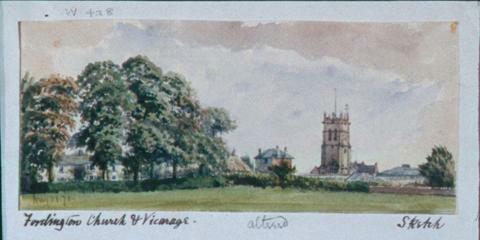 Another is the watercolour and pencil sketch of Fordington Hill shown left which was done around the same date. By 1861 Henry Joseph was still acting as a tutor and secretary but had moved onto work for Earl Fitzwilliam and was in residence at their stately home at Wentworth Woodhouse in Yorkshire (See picture right). This is arguably one of the grandest houses in England, a magnificent structure over 600 feet in length, famous as the longest frontage of any country house in England. It is not clear how he met his wife but he married Elizabeth Young on 5th June 1862 in St George’s Church in Edinburgh, when she was about 28 years old and he was 37. She was the daughter of John Young a solicitor of the supreme courts and his wife Margaret. From that year we know he was working in Scotland where he managed the estate of a Mr Murray Stewart in the village of ‘Gatehouse-of-Fleet’ in the County of Dumfries & Galloway. They had 4 children there, the eldest dying in infancy; followed by Margaret Elizabeth in 1864 who was to marry the Reverend Edward Charles Leslie in 1906; Henry Reginald in 1866 who became the vicar of Bozeatcum-Strixton; and John Frederick in 1870 who later went to live in Canada. Henry Joseph continued to paint producing over 200 watercolours relating to his time North of the Border. Henry Joseph and his family left Scotland in 1877 and according to his younger brother Handley, he worked for a short time for the Duke of Abercorn in Ireland as one of his agents at Barons Court in County Tyrone. This does not however seem to have suited him as after a year he returned to Dorset settling into rented accommodation at Radipole, about six miles from Fordington towards Weymouth. 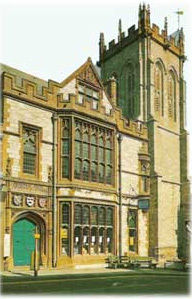 Henry Joseph remained at Radipole until 1883 when he was appointed the first curator of the Dorset County Museum, and he moved to live in Dorchester at No. 3 Trinity Street. In 1845 the Great Western Railway came to Dorchester and the proposed route of the line threatened several important archaeological sites and this aroused local residents to action. They successfully lobbied the head of the GWR (the famous engineer Isambard Kingdom Brunel) to change the proposed route of his line, and the following year the Dorset County Museum was founded to ensure that the preservation of Dorset's heritage was continued. Two of its founding members in 1845 were Henry Joseph’s father, the Reverend Henry Moule, and their long standing friend the Reverend William Barnes. In 1883 a new Museum was built on the site of the Old George Inn, and William Barnes who lived in Dorchester survived long enough to see Henry Joseph became its first curator. As curator he was responsible for classifying, arranging and supervising the collection in the new building, a task he revelled in and a role he enjoyed for 21years until his death. On Sunday morning, March 13th in his house at Dorchester, aged 78, died HENRY JOSEPH MOULE, MA, for more than 21 years curator of the Dorset County Museum, to the development and arrangement of which he had untiringly devoted his great knowledge, with a success which leaves it a model of its kind. He was the eldest of the eight sons of the late Rev Henry MOULE, 51 years vicar of Fordington, Dorchester, and his surviving brothers are the Bishop of Durham, the Bishop of Mid China, Archdeacon Moule of Ningpo, China, and Mr C.W. Moule Senior Fellow of C.C.C. Cambridge. In the churchyard of Fordington he will be laid to rest on Wednesday, beside his parents. A man of wide and accurate knowledge, along with a sensitive modesty of indefatigable diligence and love of duty, and withal of warm affections and large sympathies,as 'keen' for his Bible class of working men and for a parlour Missionary Meeting as for prehistoric Dorset antiquititie, he is lamented by neighbours and friends with no conventional grief. Twice, with difficulty, he was induced to publish "Old Dorset" and "Dorchester Antiquities" are the work of one who knew thoroughly and understood how to present his knowledge with a certain warm homoliness of his own. He was an active water-colour sketcher to the last, and his portraits of the quiet beauty of his long-loved neighbourhood could hardly be better for truth and life. After a long life of unbroken health, heart trouble appeared two years ago, and cardio ashthma called him finally away leaving his widow, his daughter, and two sons to mourn their great loss.